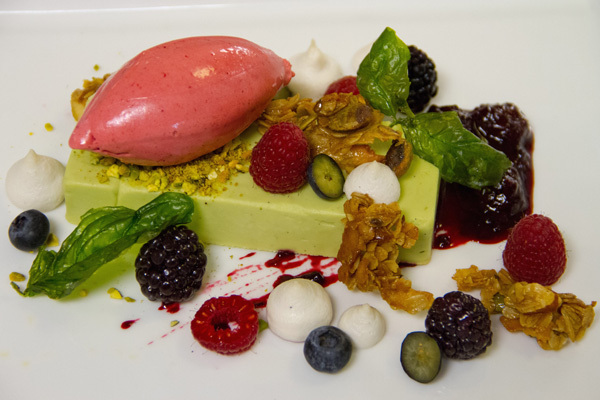 Pastry Chef Audrey Enriquez chatted with us about her approach to healthy desserts, which she creates for the Elements restaurant at The Sanctuary on Camelback Mountain. She uses this granola to add crunch to her Vanilla Avocado Mousse but she says it is so good that guests buy it by the pound for snacking and to eat as a cereal. In a small pot over low heat, warm the brown sugar, oil, syrup an salt. Stir mixture until sugar is completely dissolved. In a large bowl, combine the oats, coconut chips, pistachios and seeds. Pour the hot syrup mixture over the dry mixture. Toss the mixture to coat all of the ingredients as evenly as possible. Spread granola out onto a parchment lined sheet pan. Bake at 325 degrees, tossing the mixture every 5 minutes, until golden. Remove from oven and toss once more before letting it cool. Once cooled, break the granola up by hand. Store in an airtight container at room temperature.